This is my first python. Picked him up yesterday. he's just over 2' at the moment. the housing is a little small but is gonna be changed next week from a 9l tub to an 15l, gonna let him settle and get a feed before i move him. he's coming up for shed so should be gd to see his fresh colours. Nice snake but it looks like a normal coastal carpet python and its semi arboreal mate! sorry if im sounding aggressively defensive but i really dont mean to. 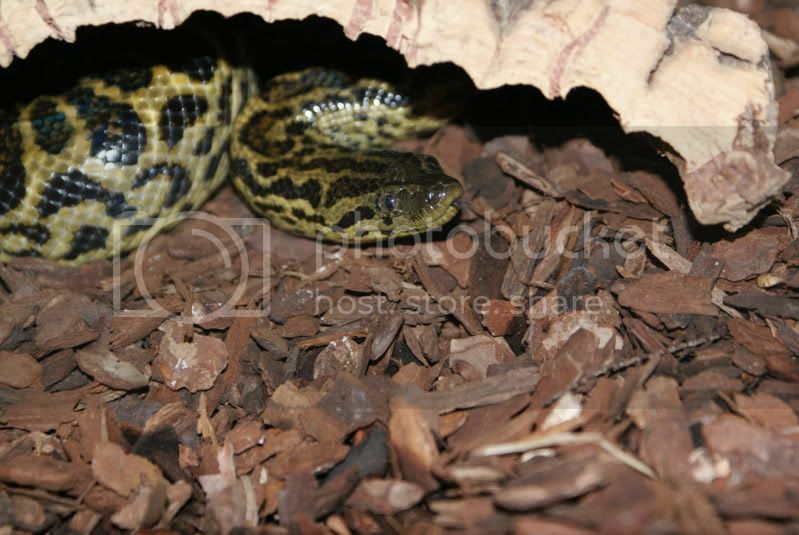 Do u keep many carpet python at all? if so, any advice? hey frylock. got introduced to carpets while reading about gtp's and loved the look and sound of them since. beautiful, impressive looking snakes yet (mostly) tame. I used to have 2 coastals and when they are younger they a very aggresive but once they mature they calm down alot. yeah ive read that alot about the carpet pythons. i held him in the store and he seemed fine, let me check him over no problem but i no im gonna get bitten at some point but they're worth it. i hear they're mainly ok once they're out of the viv's, its actually removing them when your most likely to be bitten. that true from ur experience? do u have any pics of your semi-arboreal set-ups? trying to think of a gd balance between visually attractive and practicle to keep clean. Have to say im not up on all this morph stuff, but if it lacks the jag gene (from what iv read) then it's probably kosher but will look a lot like a macdowelli as harrisoni used to be classed as small macdowelli at one time, but with the smaller adult size from the harrisoni and cheynei (if the jungle in "jungle jag" is M.s.c im not on this stuff) background, Like Damien said you will find they spend a lot of time arboreal in coil on a branch if you give them one thick enought to take their weight they will still do that even when they get some size on them. yeah definetly gonna make a gd perching site for him. building a rack system soon on one of the walls in my room. gonna be 8'x7'x2' and is going to contain 6 vivariums. should be really gd. im thinking of using MDF but lining all the vivs with acrylic so that they will last nearly forever no matter what humidity is in them; should be an interesting project. picked him up today to change his hiding box to something a little smaller and he didn't bite at all, not even a strike,which was kind of a surprise since i've only had him since thursday and he hasn't had chance to settle in yet.